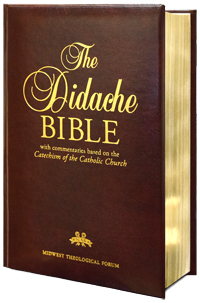 The Didache Bible with the New American Bible, Revised Edition, includes the Old and New Testaments and presents extensive explanatory and apologetical commentaries based on the Catechism of the Catholic Church. "I highly recommend the Didache Bible as a means for Catholics to better understand the Word of God in Sacred Scripture. Its commentaries are accessible both in their level of scriptural scholarship and in their explanations of the faith. It is ideal for students and those participating in Scripture studies as well as those who seek to contemplate the Word of God in prayer. It is my hope that the Didache Bible will be a valuable resource for many Catholics seeking a deeper understanding of Sacred Scripture as a text written by people of faith for people of faith." An index of subjects, including biblical names. The font size for the text of Scripture is 9.5 points which is comparable to the font size used in most business letters. The font size for the text of commentary is 8.5 points. Gilded pages for the leather edition.